We noticed an interesting change in Facebook today which could potentially have an effect on Facebook Ad Pricing. Historically (at least over the past year) users have been typically shown no more than 4 Facebook Ads at a time as they are browsing around, BUT tonight I noticed a slight change in this policy. I saw 6 ads on my news feed. 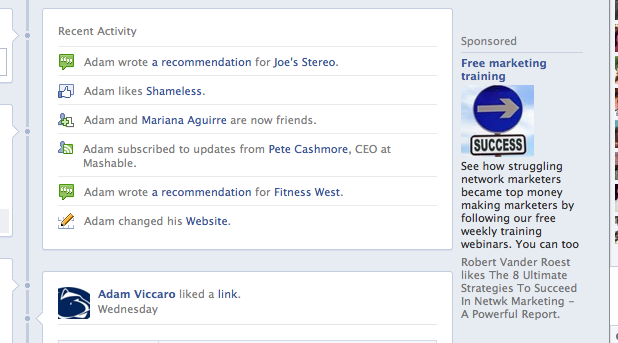 To the average Facebook user, this will probably go unnoticed, but for advertisers this is a HUGE change. At first glance, it would appear that ad space on Facebook has just increased by a whopping 50%, but don’t get all excited and create a bunch of ad campaigns. We need to take a more in depth look at the implications this will have on Facebook advertisers. Thanks to Inside Facebook, we found that ads are estimated to be the second largest source of income for the social media giant, so its to be expected that they try to increase their ad revenue. The largest source of income is estimated to come from ‘Social Games’ such as Zynga & Farmville, as well as a sizable amount from Microsoft via Bing search results within Facebook. 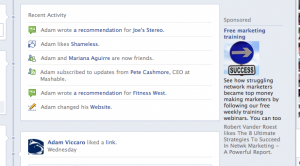 So how can Facebook increase advertising revenue? Simple: Increase the price of ads and/or increase the amount of available ad space. It would seem as though they are attempting both at this point since Ad prices have been going up lately. The answer to the first question is simple; users will be completely overwhelmed with joy because they will have so many more ads to choose from. Hmm, not so much. But seriously, the effect this will have on users will most likely be minimal. Facebook has already become extremely busy with the updated News Feed and “Creeper Box,” so a few more ads as you are scrolling won’t do much. How Will This Affect Facebook Advertisers? Increased ad space should theoretically mean a drop in ad prices. As advertisers compete for ad space, it becomes more crowded. Demand rises and supply diminishes due to lack of available ad space, therefore ad prices increase. Well if you increase the amount of supply by adding 2 more ad positions, ad prices should theoretically decrease at least temporarily. We’ll have to wait for the data on this to come out, but I think any possibly decrease in prices will be negligible. With 6 ads being shown, users with smaller screens won’t be able to see the bottom ads until they scroll down. Users with larger screens will see all 6 ads at all times. This creates complications with both impressions and click through rates. If 6 ads are shown for the user with the smaller screen but that user never scrolls down, will that still count as an impression? If so, the true number of impressions your ads are seeing (actually being viewed, not hidden below the fold) will be lower than the actual number of impressions Facebook is saying you received. This will have obvious implications on click-through-rates since that impression count won’t be accurate. One question which we don’t have the answer to is: Will Facebook introduce a way to not count these below-the-fold impressions, if they haven’t already. Facebook ads are different than Google ads because they are based on Demographics not Search Query. This means that Facebook most likely calculates ad costs based on the demand for advertising for a specific demographic. More competitive demographics will yield a higher cost per click for advertisers. With this demographic based pricing structure you will see some crossover in demographics, which may have an effect on ad positioning. For example: I like swimming, poker, and internet marketing. These are three unrelated interests, but at any given time I could be seeing ads from businesses within all three demographics. It just so happens that internet marketing is an interest that is in high demand with Facebook advertisers, so Facebook will most likely charge a higher cost per click for these ads than the ads for swimming products. The question at hand here is how does Facebook rank these cross-demographic ads that represent different pricing levels. Will ads that are targeting high-demand demographics be given higher positioning because they are paying more, or will that not have any bearing. Will this widen the pricing gap for ads? Pay more and be shown above the fold, or pay less and spend most of your time waiting for users to scroll down and see you. Another factor to take into consideration is the new Timeline layout for profiles. When looking at the profile of a user who already has timeline, you’ll notice that there is only one position for ads (2 if you have a larger screen). This will be another huge factor because the potential ad space could shrink again. An interesting way for Facebook combat this is by showing sponsored stories in the new “Real-Time Ticker,” which is something that is in the works according to Mashable. There are so many factors that will determine how this new change will affect Facebook advertising that its tough to say exactly where all of this is headed. We’ll do our best to cover each topic in more detail as we learn more.